Enter to Win 1 Month Membership! 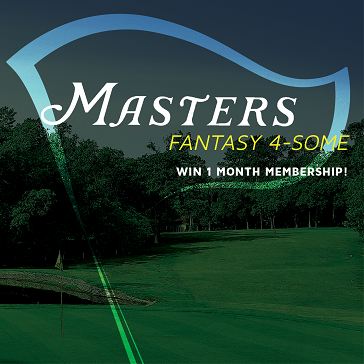 Pick 4 players you think will play well during the 2015 Master’s tournament. On line 1, write down the player you think will win, and lines 2-4 write down 3 additional players to complete your 4-some. At the conclusion of the tournament, your 4-some will be scored by the total number over or under par. For example, you have 1 player who finishes -8 and 3 who finish +2, your team’s final score will be -2. Tiebreakers will be determined through final score of the player you select to win (player listed on line 1). Additional tiebreakers will be determined if needed. You must complete all sections of this form and submit by April 9th to be eligible for the contest. Entry forms can be found in the Golf Shop. Fill out your 4-some today!